Rice cakes have not been recognized as a cause of small bowel obstruction (SBO) worldwide. We compared clinical and CT findings of rice cake SBO versus SBO due to bezoars, the most common cause of food-induced SBO. 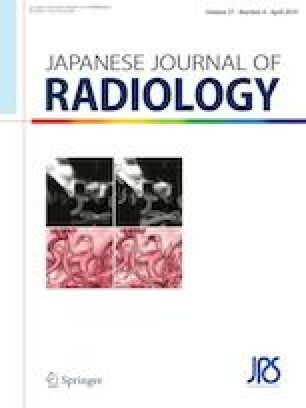 Twenty-four patients with rice cake SBO (n = 17) or bezoar SBO (n = 7) were retrospectively evaluated for clinical findings and the following multi-detector CT (MDCT) features: identification of the transition zone, presence of intraluminal lesions, degree of obstruction, and length and attenuation of obstructing materials. Categorical variables were compared by Fisher’s exact test, and continuous variables by independent t test. None of the rice cake SBO patients required surgery, whereas 4/7 (57%) bezoar SBO patients underwent surgery. On MDCT, rice cake residues were recognized as well-defined intraluminal lesions of shorter length (29.8 ± 4.6 mm vs. 47.7 ± 10.8 mm for bezoars; p < 0.0001) and higher attenuation (106 ± 27.8 HU vs. − 62.8 ± 14.7 HU for bezoars; p < 0.0001). Rice cake SBO patients did not require surgery. On MDCT, rice cake residues were significantly shorter and higher in attenuation than bezoars. These findings facilitate diagnosis and support the conservative management of rice cake SBO. Informed consent was waived because of the retrospective nature of our study with pre-existing data. This study was approved by our institutional research board. We declare that all human studies have been performed in accordance with the ethical standards laid down in the 1964 Helsinki declaration and its later amendments.